Based on an actual “Indian Witchcraft Trial” in 1930 Buffalo, NY. A naive housewife enters a world of art, passion and Iroquois tribal lore when a French artist moves next door. His paintings of Seneca Indians lead to a brutal crime. Performances: January 18 – February 16, Fridays and Saturdays at 8 pm. Tickets $15-35, sliding scale, available at www.themarsh.org, or 1(800) 838-3006. The Marsh, 1062 Valencia Street @ 22nd San Francisco, CA 94110. Info on local restaurants, transportation and parking. Savage Arts was originally developed at The Marsh, a breeding ground for new performance, as part of the Performance Initiative, directed by David Ford. It was presented at Emerging Artists One Woman Standing Festival, April, 2007. 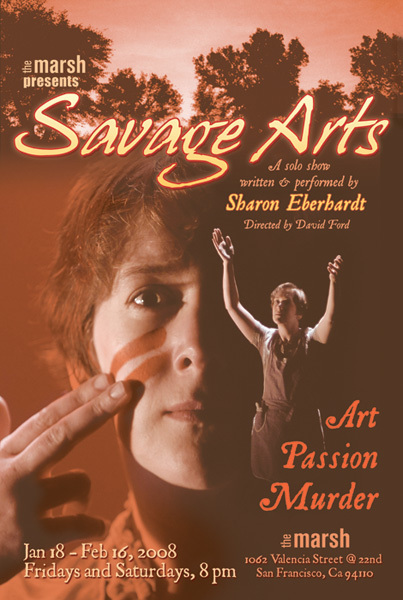 Savage Arts, a solo piece written and performed by Berkeley playwright Sharon Eberhardt, which concerns an actual murder and trial that focused on witchcraft and Native American beliefs in 1930 Buffalo, N.Y., will have its final performances 8 p.m. tonight (Friday) and tomorrow night (Saturday) at The Marsh in San Francisco’s Mission District. Eberhardt was also concerned with the impression mainstream American society had—and has—of Native Americans. Eberhardt—whose one-acts have won awards and whose full-length Becca and Heidi, a female twist on the Jekyll-Hyde story was produced by The Shee Theatre Co. in San Francisco a few years back, commented on performing her own work. There are plans for the future for Savage Arts. Eberhardt, who’s from Buffalo, has an M.F.A. in playwriting from Columbia. Her husband, Perrin Meyer, introduced her to his friend, Malcolm Margolin, author of The Ohlone Way. 1062 Valencia St., San Francisco.